The Male Hooded Merganser seems to get all the attention because of his coloring and fan-shaped white crest however the Female Hooded Merganser is very attractive with her tawny crest. I was visiting the Viera Wetlands and this beautiful Female Hooded Merganser took off from the water with no sighting of the male. They are only winter residents in that area of Florida so maybe he was nearby. They are capable of taking off very quickly from water so I feel fortunate to have captured this image. This entry was posted on Friday, January 18th, 2019 at 11:17 pm. 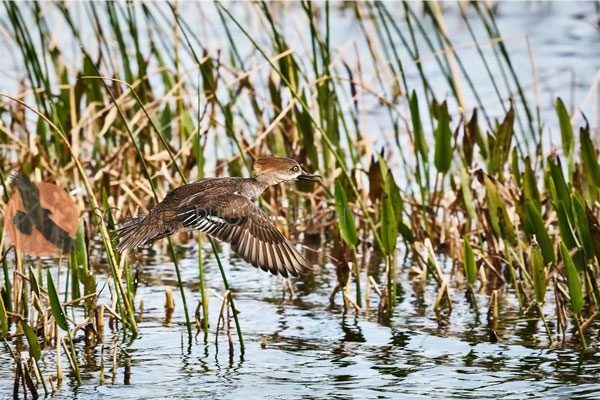 It is filed under Animals / Wildlife, New Images and tagged with Female Hooded Merganser, Female Hooded Merganser taking off in flight, florida, scalderphotography, Viera Wetlands. You can follow any responses to this entry through the RSS 2.0 feed.